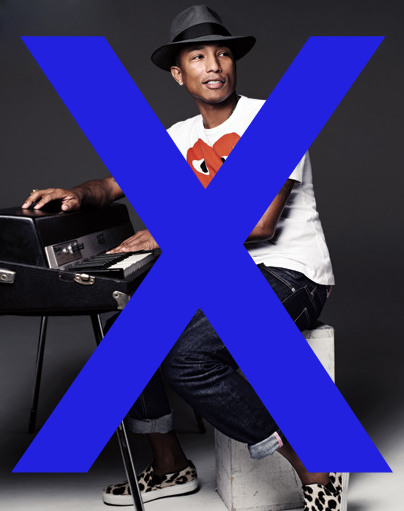 nero profumo: Comme Des Garcons For Pharrell Williams - Girl: Unhappy! Comme Des Garcons For Pharrell Williams - Girl: Unhappy! Being myself a Comme Des Garcons aficionado, I don't deny that the news about this collaboration with Pharrell Williams left me a bit surprised. Yes, CDG delivered a bunch of *fancy* streetwear-inspired collections in the past (especially in their *Play* line) but, for the most part, I think their aesthetic is very distant from diamond rings / earrings and revised ranger's hats. I'm surely missing something here because there must be something else beside, um, mere commercial purposes that links these two entities but, when I think about Comme Des Garcons, what immediately comes to mind is their unmistakeable drop-crotch pants or their most avant-garde / punk-ish designs. I can't help it. Bascially because that's what I always liked about the brand. I can honestly live without their doodle-style red-hearts logos. With that said, the fragrance is nothing more than a decent spicy woody concoction with floral facets. It opens with a leafy / green violet note paired to pepper. A smooth and kind of milky accord provide a fig-like vibe and some entertaining juxtapositions between transparent notes and opaque ones. The fragrance then turns into a darker synth woody / incensey drydown that dangerously borders into plastic-y woodyamber territories. That's it. It's nice and, depending on your tolerance to woodyambers, it's also pleasant to wear but, while feeling *smarter* than most celebuscents available on the market, it really adds NOTHING to the Comme Des Garcons roster. In other words I would say it's a trite CDG and a good celebuscent but given that my interest towards this fragrance was mainly because of the CDG's involvement, I'll have to stick to the *trite* aspect of it. All in all I would suggest this to either Comme Des Garcons novices or to the brand's completists. People who don't have a special fondness towards the brand and are simply into *interesting* fragrances, might want to look somewhere else. Given Kaws' involvement in the design of the bottle, this might become a collector's item pretty soon. I have to warn you that I find most recent CdG releases repetitive and exploitative of this empty woody-peppery accord so your impression did not surprise me. Pharell has his own line of streetwear and he is considered one of the best dressed music artists. This collaboration adds a little gravitas to Pharell and a new clientele to CdG. Win win situation. No doubt that's a win-win situation (in the end that is the main purpose of these kind of projects) but, beside personal opinions on Pharrell's style of clothing and tastes, I didn't completely like the fragrance. Yes, when compared to other celebuscents, this probably feels light years better but from a mere CDG-freak point of view (which is what I am in the end) this adds nothing for me. On a side note, I agree some of their latest stuff felt sort of redundant and/or not completely convincing (Wonderoud, Amazingreen, some of the Play Series) but, for the most part, I still find Comme Des Garcons to be pretty solid. Black was one of the best of 2013 in my book and Serpentine will most probably be in my best of 2014. I also dig a couple in the *Blue Series* (especially Blue Encens), Sugi and Wysteria Histeria.